Central Park 5 is a nice villa development in a quiet area of East Pattaya, which has very easy access both Jomtien beach, Pattaya city within just 10 minutes. 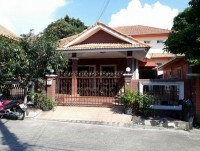 This property is a 2 storey house with a large landscaped garden, and feature pond with water fall. Inside there are 3 bedrooms, and 3 bathrooms, plus 1 maid room. It has a nice fitted Western kitchen by EuroDesign, large open plan living room, and there is an internal balcony on the first floor with a family living area. The master bedroom has a vaulted ceilng and outdoor balcony. There is an outdoor covered kitchen and laundry area.The house is offered for sale partial furnished, at a very reasonable price. The village has nice landscaped roads throughout, 24 hour security guards, a children’s play park, club house, and huge communal swimming pool. The title deed is held in a Thai name, with any transfer fees split 50/50.